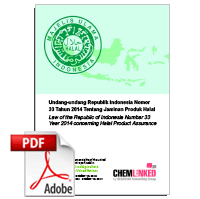 Indonesian Halal Product Assurance Law was released on Oct. 17, 2014 and will come into force on Oct. 17, 2019. The Law stipulated that all halal products which are imported, distributed and traded in Indonesia or services related to cosmetics, foods, beverages, medicines, chemical products, biologic products and genetically modified products must be certified halal from Oct. 17, 2019. Note: This translation was published by Food and Agriculture Organization of the United Nations and is an unofficial text. This document should only be used as a reference for understanding Indonesian halal certification and in case of any discrepancy between the English and Indonesian versions the original Indonesian version shall prevail.